Our Compound Magnetic Sine Table UL-401 Series is the best choice for high accuracy grinding operations. The company is a well-known Manufacturer, Supplier and Exporter Magnetic Sine Table s from Maharashtra. Our Magnetic Sine Tables are used for precision measurements, setting of angles, utilizing slip gauge, etc. The entire range of the Magnetic Sine Tables is reasonably priced by us. 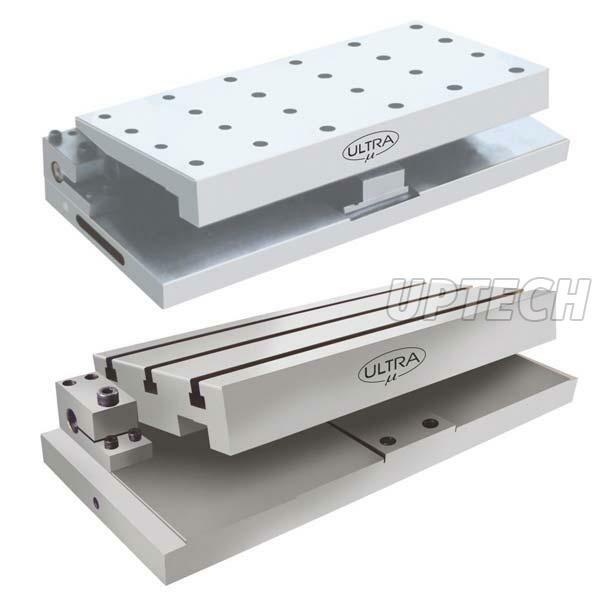 Used for Precision measurement, setting of angles utilizing slip gauge & light machining. Ideal for high accuracy grinding operations. Accuracy for squareness, Parallelism & Flatness is 0.010 mm upto 200L & 0.015mm Upto 450L. Positive locking at all angles without any distortion. Angle can be set within +5 seconds. Centre Distance between rollers is within 0.005mm. Hardness 58 + 2 Rc & Tempered. Firm clamp to reduce possibility of distortion. M6 & M8 tapped holes for job clamping. Low hight for more wheel clearence. Slotted sine table on Request. Also Manufacture as per Customers requirement.